A few weeks ago while at the shooting range I was called out to have an interview with the company commander (M"P). The company is about 150 guys, I'd say. The commander of a company is a commissioned officer of the rank Seren, which is a captain in the American army. You have to be pretty damn smart and good at your job to get to that point, even though it's achievable after only about five years or so. So, as I went into the shelter to talk to the M"P, I was a little bit nervous. When we first made it to our unit the M"P gave us a speech, and I was surprised when he told us his details. Without giving too much away, I'll just tell you his age. He's 24, the same as me. So when I heard this, I understandably felt a little bit intimidated. Here I am, some pseudo-intellectual American with a degree from an artsy liberal university, serving underneath a bona-fide warrior. I thought, "What the hell am I doing here?" 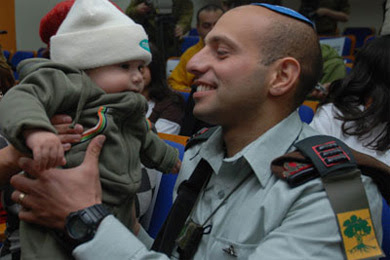 But then again, there aren't too many guys like him in the Israeli army. He's one of those bull dog Israelis that you expect to see in Tel Aviv with a really tight black shirt on and some barbwire tattoos on bulging biceps. These bull dogs tend to be bartenders, I think. If you want a visual image of my M"P, he's probably 5'5, he's built like an American Marine, and he's got a bald head. That's the Tel Aviv tough guy look. If you are missing one part of those three requirements, you're not a Tel Aviv tough guy. So anyway, I sat down for the interview and instantly apologized for my Hebrew. He was all smiles right from the start, and he asked me all about my education, why I wanted to serve in the Israeli army and not the American, and so on and so forth. This tough guy turned out to have a great personality, and we had a nice chat about the State of Israel and her army. He found out about my life, who I am and what drives me, and I felt like he was honestly interested. I mean, I'm not the average kid that he is going to have an interview with. I am unique here, and I felt like my presence was appreciated. Even though he probably did with everyone else, I was really honored to shake his hand at the end. He knows how to be a good commander, obviously. He's strong and connected to his soldiers at the same time. Despite his warmth, I still can't help but be afraid of this guy. He scolded me a few days ago for having my gun strap around my shoulder instead of around my neck, the necessary position while wearing the combat vest. In my defense I was building a tent and we had permission to have it around our shoulder instead in order to put it out of the way while still wearing it, but it's not like I am going to make some excuse to my company commander. I know when to shut my mouth and accept punishment. "The next time this happens... I don't even know what," he said. "Yes, Company Commander," I replied. Either way, he knows how to do his job, and I am fortunate to have yet another highly professional, battle-tested (more on that later), competent, and understanding officer in the chain of command. Oh, one last point. Of all the things in the world, you know what I noticed right away when I had my interview with him? His teeth are perfect. White and properly spaced and aligned. He has movie star teeth. What a strange thing to think of over and over again during an interview with a true warrior.